Just a quick card today. 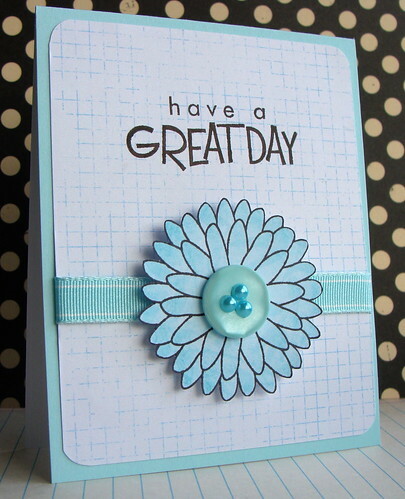 I used THIS yummy new grid paper by Jen Martakis, and THIS cute flower stamp by Hero Arts. The sentiment is from THIS set. LOVE me my Papertrey buttons - I just added some of THESE gems. :) Oh and the ribbon is American Crafts. P.S. Just hit 500 followers! Hooray. So excited. Keep watching - giveaway to follow soon. Love the shades of blue. The pearls on the button is a great touch. Beautiful card - very soft and peaceful. Love your work. I'm adding your blog to my reader. Love the ever-so-soft blue on the flower, very pretty! so sweet! 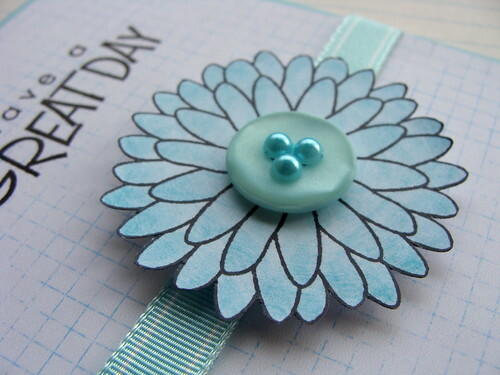 love the pretty colors and the button + gem flower center! beautiful as always congrats on 500 followers your blog is always amazing!!! Beautiful card as always. Congrats on hitting 500! Lucy, I don't post often but I read your blog every day. Even when you don't post (I have pages archived)! thanks for being a great source of inspiration. Congrats on hitting 500! woohoo! Love all the blue on this card, so pretty!